I blogged a couple of days ago about my displeasure with the behaviour of a particular station who was calling D44AC in Cape Verde on 10m. I gave up trying to get through the pileup on day #82 and a little later I switched to 15m. There was D44AC calling CQ on 15m with very few stations calling him so I called and worked Carlos on my second shout. I said in my previous blog that the DX will always be there again and in this case I only had to wait a short while to work Cape Verde, a new DXCC. Afte that I had a QSO with Oliver, CT9/DL9OLI on the Madeira Islands when I was running just 10 watts then I switched to 40m and worked HB9TWY, Yan followed by a JT65 contact with S57YX. Later I had a tune around 80m and heard GX3ZME, Simon at the Telford and District Amateur Radio Society calling CQ so I replied and we had a quick QSO followed by 2E0LYO, Barry in Carlisle on the same band. Before I turned in for the night I had another shout on JT65 and worked EA3FHP, Josep and then MX0HTJ, the club callsign for the HamTests group operated by Paul, M0TZO. This was the first outing of their new “Ham Tests Jimmys” callsign and I’m pleased to have been the first station in their log. HamTests are great, the website is absolutely invaluable in amateur radio training and they helped my son through his Foundation exam last year. Day #83 started with a chat between myself, Yan, M0YNK and Tony, G0MBA/M on 28MHz. This was a proper natter which lasted about half an hour, none of your quick ‘five nine, thank you. Next please” stuff here. Yan is in Colchester and Tony was on his way home and both were able to provide useful feedback on the new headset I’ve got. I’ve got a Heil Pro Set Plus and initial impressions are very favourable. The transmitted audio is far superior to the supplied Yaesu MH-31 fist mic, they’re very comfortable and the in-ear sound quality is very good. After that I had a sked with Jonathan, G0DVJ/P who was over on Lundy Island for a few days and then it was time for the 80m Club Championship contest. I blogged about this last month when conditions were terrible and I was hoping that this month would be better. My aim was to beat my previous QSO count of 30 contacts and I managed that easily and with plenty of time to spare, I stopped operating when I’d had 32 QSOs. I was only operating using the search and pounce method and that was enough for me. It’s still quite tricky working 80m on my wire so I’m looking forward to the doublet going up. I’m still waiting on a couple of bits for that but it’s still going to happen. 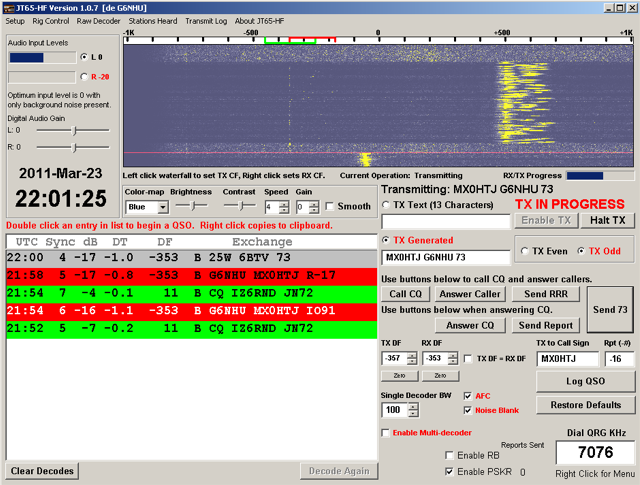 I finished off the evening after the contest working LA5TFA in Norway and RU3KS in Russia on 40m JT65. I was out on day #84 from very early until very late and I was incredibly tired once I got home so I just had a few quick JT65 QSOs to start with. I worked OZ1TMK, Torben in Denmark, DL2TE, Hans in Germany, EI9FV, Gerard in Ireland and SP1JPQ, Jerzy in Poland. I’ve previously worked Jerzy on 2m during lift conditions so it was nice to have a contact on HF as well. I also worked PD3AHW, Arnold in the Netherlands and then E74EBL, Zoran in Bosnia and Herzegovina who was preparing for the CQ WPX contest the coming weekend. All the contacts on day #84 were on 40m.